Pianist. Nominated for the Grammy Award in 2001, winner of many prestigious awards for his recordings of Schumman, Bach, Beethoven, Chopin and Szymanowski. 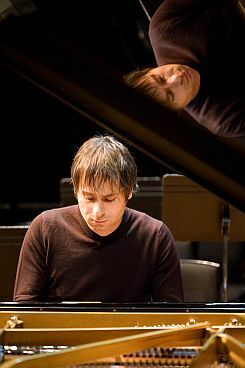 Pianist, born 4 April 1969 in Warsaw. Nominated for the Grammy Award in 2001 & 2005 and winner of many prestigious awards for his recordings of Schumman, Bach, Beethoven, Mozart, Chopin and Szymanowski. Piotr Anderszewski is one of the world's most brilliant contemporary pianists. The Independent called him "breathtaking and 'unforgettable" and the Daily Telegraph has praised the "intellectual power, profound emotional response and keen imagination that his playing conveys... Anderszewski’s remarkable ear for tonal shading and nuance is absorbingly to the fore". He has performed at London's Barbican Centre and Royal Festival Hall, the Wiener Konzerthaus, Carnegie Hall New York, the Mariinsky Concert Hall in St Petersburg and Munich's Herkulessaal. His has performed with the Berlin Philharmonic, the Boston, Chicago and London Symphony orchestras, the Philadelphia Orchestra and the Orchestra of the Royal Concertgebouw. He has been recording on the Virgin label since 2000, releasing several prize-winning albums, such as Beethoven's Diabelli Variations which won the Choc du Monde de la Musique and an ECHO Klassik award His recording of Bach's Partitas 1, 3 and 6 was nominated for a Grammy in 2001. His recording of the works of Szymanowski that won the Classic FM Gramophone Award in 2006 for Best Instrumental Disc and received a Grammy nomination the previous year. His latest recording of Schumann's works also won the ECHO Klassic award in 2011 before taking home two BBC Music Magazine Awards in 2012. Anderszewski began to study piano at the age of six and subsequently attended conservatories in Lyon and Strasbourg, the Academy of Music in Warsaw, and the University of Southern California in Los Angeles. He further honed his skills in Italy, in a series of master classes lead by Fou Ts'ong, Murray Perahi, and Leon Fleisher. His execution of the 33 Diabelli Variations in C-major by Ludwig van Beethoven at the International Piano Competition in Leeds in 1990 opened the door to his professional debut at Wigmore Hall in London, and subsequently to an international career. He has given concerts in England (with the Royal Philharmonic Orchestra and the London Symphony Orchestra), Ireland, Germany (series of Beethoven concerts with the MÜnchener Philharmoniker in 1996), France, Austria, Portugal, Italy, and in Poland. In 2001 in Paris he performed the 4th Sinfonia Concertante of Karol Szymanowski under the direction of Charles Dutoit. His repertoire also includes the Metopes, Masks, 3rd Piano Sonata, and Mazurkas of this composer. Piotr Anderszewski has performed chamber music with Victoria Mullova, with whom he has recorded three albums for the Philips label (the sonatas of Johannes Brahms, Leos Janácek, and Serge Prokofiev), as well as with Andrzej Bauer and his sister Dorota, a violinist. His album containing the music of Johann Sebastian Bach, Ludwig van Beethoven, and Anton Webern, recorded for the CD Accord label, was enthusiastically received by critics and won the pianist the "Fryderyk '96" Polish Recording Industry Award. In 1999 the Harmonia Mundi label released an album with Anderszewski's recordings of the works of Johann Sebastian Bach. In 2000 Anderszewski received the Karol Szymanowski Award. He has been living abroad, primarily in Paris since 1990. Piotr Anderszewski took his first steps towards an international career in 1990 at the Leeds Piano Competition, though in fact he did not fare well in that contest. At this unusually prestigious event, comparable to Poland's Chopin Competition, he failed to win any prize but succeeded in garnering attention with his semi-final performance of the unusually difficult cycle of Beethoven's 33 Diabelli Variations. "All other sonatas seem banal compared to this one," said Anderszewski, and Beethoven's Variations would become a permanent companion to the pianist throughout his career, up to the present time. Following the competition, the Teldec company approached Anderszewski about recording the work, but insisted on a studio recording. This was not in line with the pianist's plans: "Recording in a studio is too analytical a process, too repetitive; it's a cold and calculated way of dismantling a piece into its component parts, followed by a cold synthesis of the work. It's a different artistic discipline, and entirely different vocation," Anderszewski stated in an interview for the recording and broadcasting industry magazine Studio in 1997. He seemed more interested in facing the challenge of the moment, in the fact of having a single chance and being forced to use it. The ideal for Anderszewski would have been to record an excellent performance during a concert. Teldec refused to bow and ultimately Anderszewski did not record Beethoven's Variations for this label. The pianist nevertheless received performance offers and began to give concerts in England, Ireland, and Germany. He also appeared solo or with orchestras in Rome and Lisbon, Prague and Munich, but most frequently in London. For a time the pianist traveled the world with violinist Victoria Mullova, whose career was blooming at the time. The duo traveled to Japan, the Far East, and throughout Europe, and it was in the end with Mullova that Anderszewski made his first recording. The album, produced by the Philips label, contained the sonatas of Debussy, Janácek, and Prokofiev. This was followed by another album for Philips, also with sonatas, this time those of Brahms. Finally, Anderszewski arrived in Poland, where he both began giving solo concerts and recording. The pianist's first solo album was published by CD Accord and contained recordings of the works of Bach, Beethoven and Anton Webern. Anderszewski says that over the years he deepened his knowledge of Beethoven's series, and when his expanding career got the attention of Virgin Classics, a division of the publishing giant EMI, and he was offered the opportunity to record the Diabelli Variations, he did not hesitatem even though he would be forced to do this in a studio. The record received excellent reviews, and Virgin decided on another album for which Anderszewski recorded two of Mozart's concertos. Anderszewski has gone on to record many more albums for Virgin, which have won many major international awards, such as the Grammy-nominated albums of Bach's Partitas 1, 3 and 6 and of selected works by Szymanowski in 2001 and 2005, respectively. In 2011 Virgin released an album of Anderszewski performing Schumman, which won the ECHO Klassic award in 2011 before taking home two BBC Music Magazine Awards in 2012. Entering uncharted waters is nerve-racking and can pose innumerable problems. This was certainly the case. But what satisfaction, what a wonderful revelation when a new continent comes on to the horizon and the world becomes much more extensive than one could have imagined! This was the case too. The difficulty with Szymanowski lies in finding the guiding thread, that line which leads one from the first note to the last. It's very subterranean, not visible at first glance. It's perhaps for this reason that his music is not much played. Once one has discovered it, understood and heard it, his music takes off, acquiring a limpidity and inevitability which is almost Mozartian. I well remember the day when this 'inner thread' revealed itself to me for the first time. It was when I was studying 'Calypso.' I felt a supreme sense of elation. Szymanowsk is one of those geniuses for whom pure inspiration and the musical text are one and the same. In spite of the complexity and refinement of his writing, the musical impulse remains completely intact. Nothing of it is lost in the process of committing his music to paper. Source: Polish Music Information Center, Polish Composers Union, anderszewski.net. Updated and Edited by Agnieszka Le Nart, April 2012.